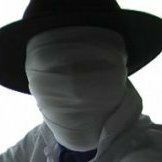 Xenonauts-2 Version 0.12.0 (Public Combat Test) Released! This new version of Xenonauts 2 is a free public test build, released free because it is still an early build and we don't yet think we can justify charging for it; full details on where to get the build can be found in this thread. The next update is due on Tuesday 4th July, although if necessary we will also release hotfixes for any game-breaking bugs encountered in this build. Grenade Launcher: This was added in hotfix 11.2, but it's a lighter version of the rocket launcher from Xenonauts 1. It's fun to use but largely ineffective at the moment because we've not yet coded the stuff that makes it do extra damage to terrain, and terrain isn't showing visual damage yet either. Once we get that in it'll be a useful cover-removal tool. A building wall has a 100% stopping chance and thus will completely stop an explosion, provided it has enough HP to do so. If the explosion is powerful enough to destroy it, any extra damage will continue to propagate to entities behind the destroyed wall. Half cover (e.g. a rock) has about 40% cover, so it will stop 40% of the explosion damage. This means being behind a rock will provide partial protection from something like a grenade but 60% of the damage will get through (more if the grenade does enough damage to destroy the rock). 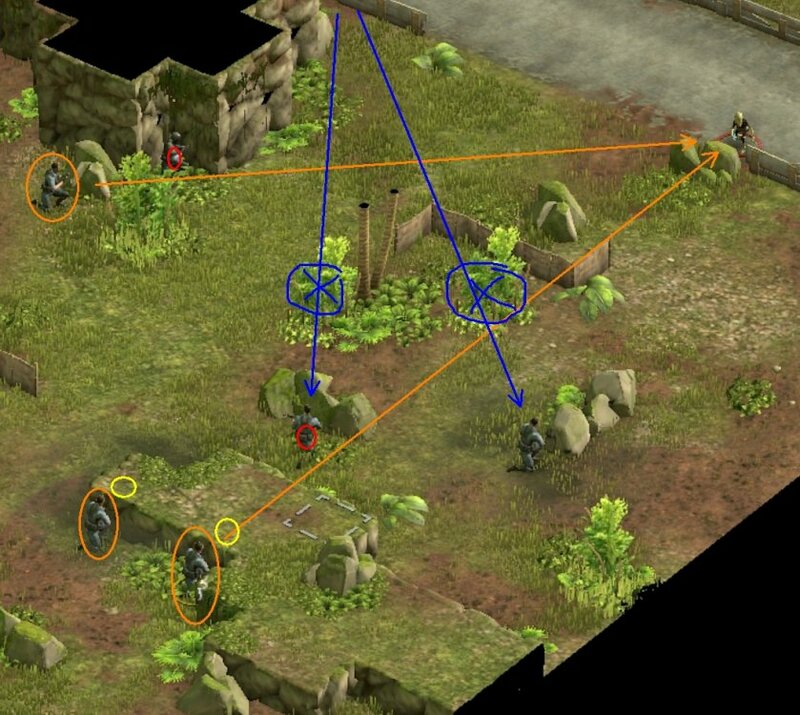 Units have a 25% stopping chance, so if a unit steps on a grenade it will absorb some of the damage and reduce the damage inflicted on adjacent units. Again this is capped by HP, so an armoured unit can absorb more of a powerful explosion than an unarmoured unit. We think this is simple but effective way of modelling explosions - it neatly takes into account the position, size and toughness of everything in the blast radius. Should generate a relatively realistic outcome from using explosives of varying power! The fire cursor now has priority over the door cursor; this means shooting at aliens in a doorway is much easier (although shutting the door in their face is harder). Reloading weapons no longer makes the grenade disappear. The fire path now turns red once a weapon goes out of range, but only the tiles beyond range turn red. Grenade launcher now has a 4-round clip instead of a 6-round clip. Returning to the main menu screen no longer greys out the button text. Playing multiple missions in the same game session no longer gives you the same map both times. Fixed the UI not appearing if you attempt to play multiple missions in the same game session. Fixed a couple of codebase errors that were causing firing-related crashes and UI issues. So this is largely a bugfix release rather than a gameplay update - we've fixed up a few recurring errors that were spamming our error reporting software. The work on the explosions and grenade launcher is pretty cool but you won't really see the full effect of it until we get more powerful explosives in the game and start visualizing damaged props a bit better. The first reason for this is the strategy layer - in recent weeks most of the team has been either working directly on that, or working on the ground combat / strategy merge. The merge is a big job but it is progressing quickly; we've done most of the key work involved in loading up ground missions from the strategy layer with the correct parameters (e.g. biome type, UFO type, UFO crews, soldier stats, soldier loadout, etc) and now we're concentrating on passing things back the other way. This involves soldier experience and injury tracking, it involves tracking what recoverable items have been destroyed / not, and it involves a load of boring stuff to do with making sure data loads and unloads properly as you switch between the two layers. Big job, but things are coming along well. It's also worth noting that we're doing quite a lot of work on the strategy layer itself too, both in terms of art and coding. I'm looking forward to unveiling all of that, perhaps in about six weeks. There's also a bunch of semi-complete work that requires a completed merge to work properly, like making soldiers display models with the correct gender / skin colour / hair colour based on their portrait and so forth. Models are all done, we just need to hook it all together on the code side. Unfortunately, the second reason for the delays has been holidays. This is unfortunate mostly because it's going to affect next week's build too, as both our Technical Director and resident artist are away for two weeks on their respective summer vacations. Given we're quite a small team and they're both important people, it's going to slow things down ... but apparently there are laws against chaining people to their keyboards, so there's not much I can do about it! The next update will therefore again be mostly bugfixes given the ongoing merge work and our depleted personnel. The merge will be worth it, though - playing standalone combat missions is only ever going to be so much fun, but once we add the strategy in there'll be a whole load more to see and do! Explosion Logic sounds good to me to make it a playable and somewhat realistic feature. Sure thing only gameplay will show if it "feels" right. Do you intend to use a ballistic arc to shoot over obstacles, mainly the large rock formations, with the grenade launcher? I mentioned this in post of the last version. Let them take their holidays, don't rush. Better have a good game than an early and buggy game. If memory serves correctly from previous discussions, the grenade launcher has always been intended as a direct fire weapon. I can understand why - you may as well call the grenade launcher an unguided blaster bomb launcher and be done with it if it were authentically represented, but I believe this decision is going to draw considerable ire. I personally believe the grenade launcher should be replaced with something more suitable. A recoilless rifle would, I believe, be very suitable in terms of era, gameplay and authenticity as a successor to the rocket launcher. I agree with Max on this. If the grenade launcher can't be used to shoot over objects you should name it something else. Recoilless rifle is good or just go back to rocket launcher. Personally, I see no reason why you can't just allow it to function as a real grenade launcher. You have hand grenades that can be tossed over objects and so the grenade launcher should work exactly same way except have much longer range and horrible accuracy in indirect mode. I'd just throw in a large accuracy penalty when trying to fire one over anything, mostly on range axis i.e. it tends to land short or long. It shouldn't be too hard as you already have Line of Sight mechanics in the game. That would discourage people from using them as "artillery" since the ammo supply is limited and in close combat you're likely to hit your own troops. I'm assuming the average solider could probably only carry 4 to 8 additional rounds of ammo for the grenade launcher. In real life, someone has to estimate the range accurately when they are used in indirect mode and a base plate is often employed that effectively turns them into little mortars. Without the base plate you probably won't hit anything with the first round and at worst you'll waste a lot of shots trying to find the range. You'd also need an observer if the target is not visible to the shooter. Hitting a moving target would be nearly impossible. Your explosion mechanics ideas sound awesome by the way. I'm all in favor of those. A problem with recoilless rifle is that they are universally single-shot, not to mention that they seem to fire much bigger shells. True, but there are smaller ones that can be handled by one person and reloaded fairly quickly like the M18 57mm. I'm not sure what the best approach would be. I just don't like a grenade launcher that can't fire over something. Yeah, but people won't like a multi-shot rocket launcher (or one that does relatively little damage) either. Unfortunately, I'm not aware of any real weapon that fills the intended battlefield niche. I wonder if calling it the "Heavy Cannon" as an homage to the old Xcom game might be enough. It won't fit in the lore of Xenonauts, but that might draw less ire than a grenade launcher not behaving as the user expects. My other thought is you don't have to give it a name that means anything specific. You could just call it the XA40 or some other designation that means nothing specific other than a model number. That way people won't expect it to act in some specific manner. You can simply describe what it does and how to use it. That way YOU set the users' expectations instead of the other way around. I don't know. I think semi-automatic grenade launcher have always had a lower arc than hand thrown ones. I haven't watched much demo but those I saw are pretty direct shots. Hmm, yeah, that's potentially not too far off the sort of thing that we want - although a 25mm grenade is getting pretty small. I suppose we could always make it an early-game research project too, that way we can frame it as being a new type of weapon rather than an existing one and explain it on our terms (in which case it could indeed be the Heavy Launcher as Shoes suggests). 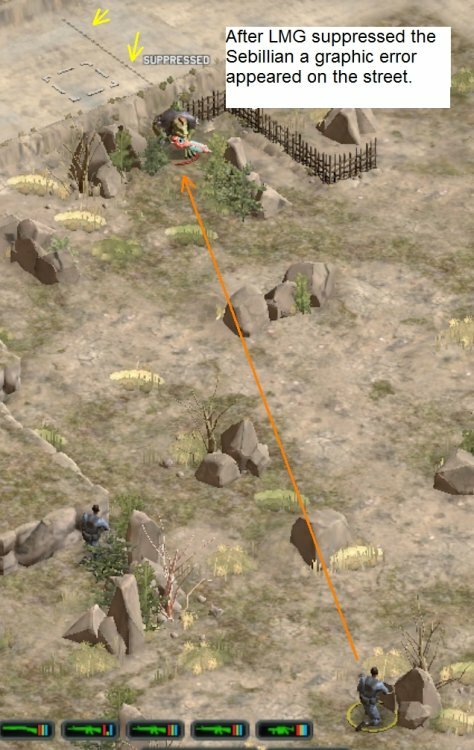 Yeah, grenade launchers do have flatter arcs than thrown grenades - but you can still fire them over walls to hit units out of direct line of sight. It's just the angle is more limited (albiet with longer range). Yeah, an early research project would be OK. That system in in the wiki is actually quite deadly because it uses proximity fused mini-grenades, so you shoot over enemy cover and the grenade detonates above or behind the target. It basically negates anything but a pillbox or covered foxhole as cover. Even buildings aren't safe because it can be set to fire through any window or opening and blowup inside. But you are right about the small size, it wouldn't destroy much cover. However, it would be a great stun gas, mine, or poison gas delivery system and it could still destroy cover fairly quickly because it can fire MANY explosive rounds quickly and that adds up. The rate of fire is important. I'm guessing, but I imagine a direct hit from a 25 mm explosive round would probably blow a two or three foot hole in a brick wall. I imagine some alien upgrades would also up the explosive power of the weapon eventually. Could play a single combat. First time with X2 for me that the game crashed. Played with Fantastic Settings at 1200x800 fullscreen. After an annoying combat, see below, opened the door of the UFO. The usual guy stands at the door, hit him with a burst, he turns but nothing else. Killed him with a target shot. Way is free now, see alien behind an UFO structure. Threw grenade, the little click sound comes as if the grenade lands in front of the soldier, the alien hit sound comes, the alien screaches, the throw animation comes, the explosion comes and takes away some UFO walls. Game freezes for a second and is gone. Was amazed that the grenade didn't got stuck on the door frame, but the other result is not better now. - When switching from soldier to soldier the tree view level is always switched back to 0. I don't know if this was so before, but I would like to have it keep my settings. - In 90% of the cases grenades and launched grenades can't get over cover in front or past rock edges...at least this is my feeling of it. 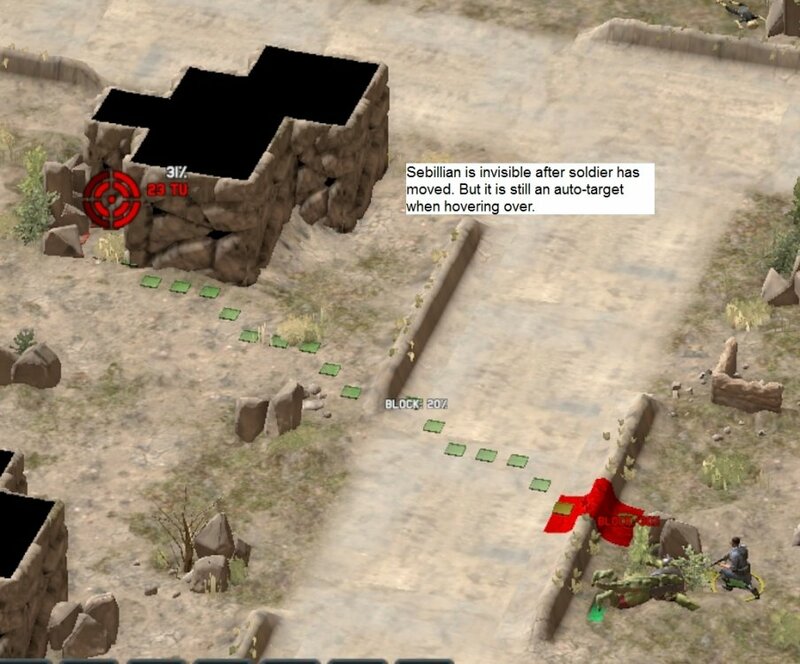 - Sniper at the bottom right hit the cover in front of him (yellow circle) twice and the soldier with the red circle near the bullet path towards the alien once. 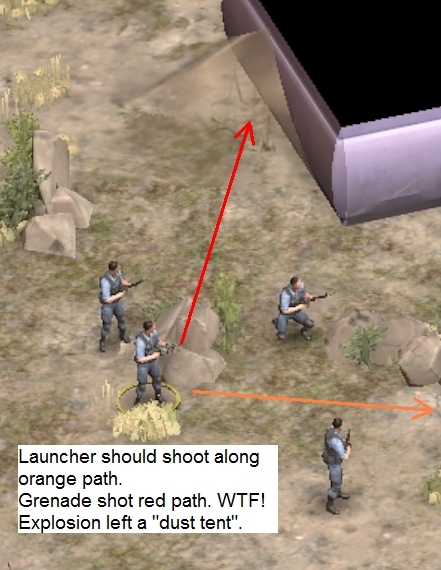 - The Launcher next to the sniper at the bottom hit the cover in front of him (yellow circle) twice or thrice. It worked great in reaction fire though. - LMG at left edge had one burts on target, hit the rock in front of him and the soldier (red circle) too, killing the poor chap. Nothing hit the alien. 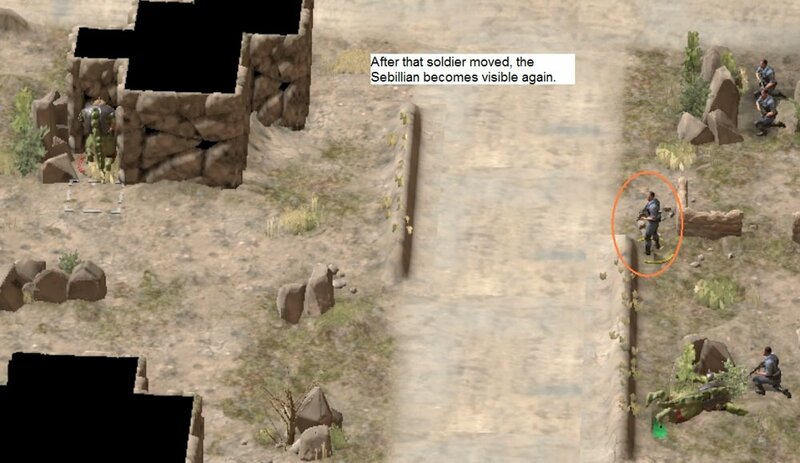 - Three Sebillians at the origin of the blue arrows shot at the two soldiers but luckily hit the bushes in front the most of the time (Ok, the right guy died later). The hit sound of the bushes is the hit sound of rocks and are withstanding. - The cover-problem continued until the UFO door was opened. Same settings as before, no crash now. - Haven't mentioned it before, but all red caps have dissappeared from soldier heads. - When the Shotgun is clicked to reload, the ammo is not refreshed, ths reloading sound is there. You have to swicth to another soldier and back to see the 8/8 again. - The thing that aliens can shoot through the walls is really mean inside the UFO when there are more than two. Had four aliens inside the core room and they slaughtered my guys from the inside. 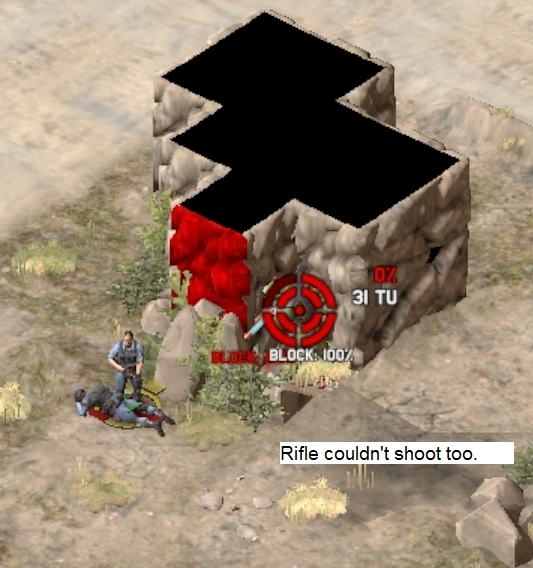 - Ground tile has graphical error after shooting. A similar thing but a bit larger happened on another tile, also after shooting. It seems to be bonded to the small stone wall or the street itself when one of them gets damaged. It vanishes with the turn or when the map is panned away and back. - Alien is visible...invisible...visible again (see picture texts). 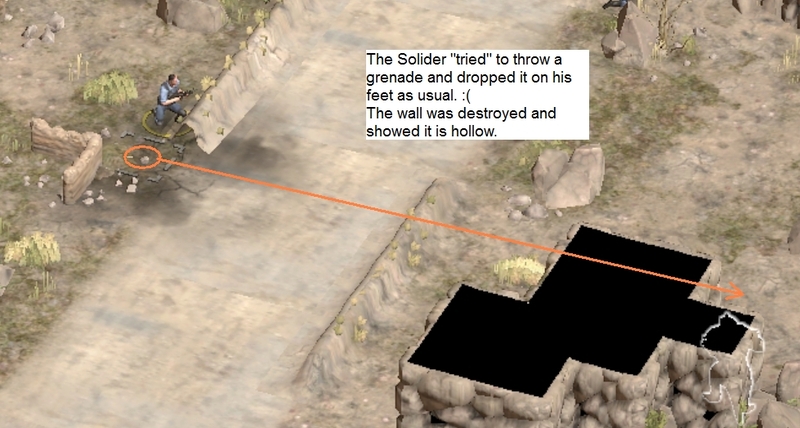 - Soldiers and Aliens can shoot over different objects? Tried the Sebillian from the other side, see picture texts. 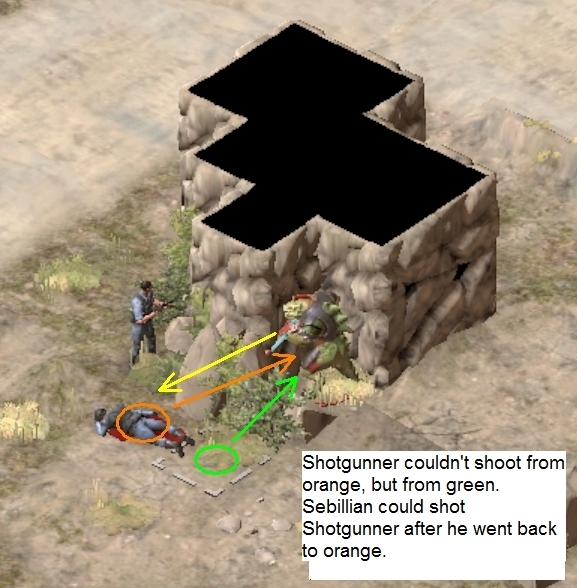 The Rifleman could kill the Sebillian from the green position the Shotgunner could shoot before. 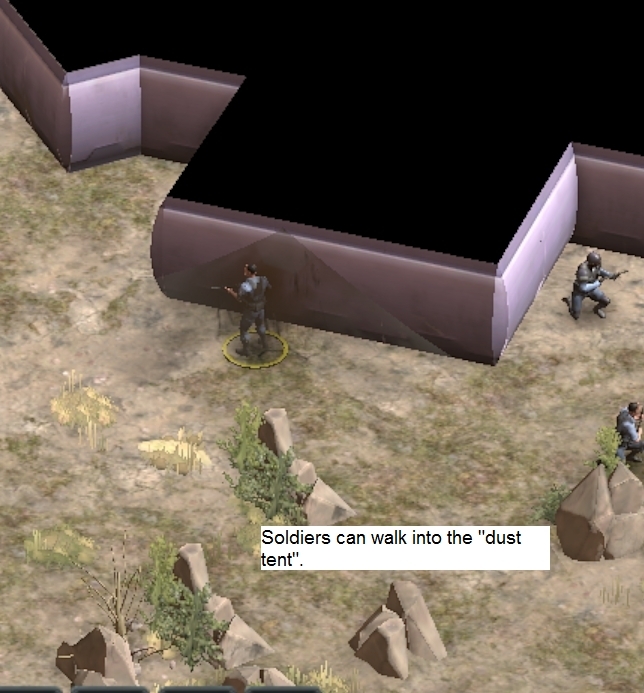 - Dust Tent build by Grenade Launcher (see picture texts). 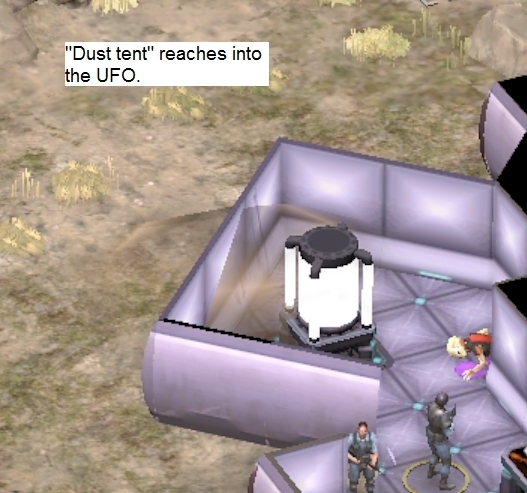 A frag grenade explosion inside the UFO will also build a dust tent, although the dusty ground is covered by UFO floor. Thanks. We'll have a look through that all before the next build and fix up some of the issues (plus some bugs that are causing slow performance). Yeah, this post (and my log-file ) is just more to confirm the things that has been already mentioned alongside noticing that the AI is back on shooting and hitting when there is no line-of-sight ( I.E. they shoot through walls and everything else effortlessly ). On a side to some older issues: I've been now playing with the "auto-resolver" on ( I.E. I let the game automatically to reaction-shot to "overwatch" ). Not only a large amount of times player-tokens refuse to reaction-fire when even chance (even giving a "shrug"), the Sebillians still seem to have further reaching line-of-sights, since they are more than happy to aim and shoot at soldiers that are further behind the lines (of humans). This somewhat makes me think the AI is "tapping" into the "commander"-point of view, which it shouldn't be doing. (( Well, obviously the game itself have to know that it shouldn't know about the location of my soldiers / player-tokens.